Click here to reveal the options to customise this product. 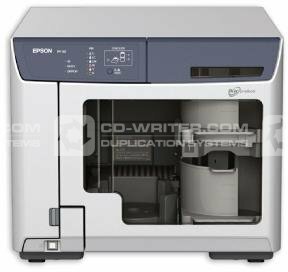 Warranty Options: All Epson DiscProducers have one years on site as standard. Burn and print CDs and DVDs the easy and economical way. The Epson Discproducer PP-50 is fully automated, leaving you free to get on with other tasks while it reliably publishes up to 50 discs in one batch. It's the perfect choice if you need to produce up to 400 discs per month. Impress clients or present a professional image with the PP-50's high-quality, photo-realistic printing on the CD/DVD surface. The Epson Micro Piezo printhead and 6-colour inks produce ultra-fine colour gradations and razor-sharp text, even in very small font sizes. Combined with the PP-50’s accurate disc burning, this means you can rely on the readability of your archived discs for decades. Thanks to Epson's individual inks system, the cost of each produced media is low as you only need to replace the colour used and, depending on the print image, you can produce over 1,000 discs from one set of cartridges. And when a cartridge becomes empty, the PP-50 automatically stops printing until it’s replaced to avoid mis-prints. Epson has drawn on its expertise in manufacturing robots to develop the patented AcuGrip robotic arm, which ensures that only one CD/DVD is grabbed at a time – even if they’re stuck together. This allows you to leave production runs unsupervised with less risk of failure. To ensure trouble-free operation for years to come, the PP-50 has a dust-proof body and minimal moving parts. The PP-50 couldn’t be easier to use – it’s conveniently controlled from the front, and its LED system shows the ink level status for each individual colour. The included software is user-friendly too, with pre-defined templates and images, so you don’t need to be an expert to use it. Epson . PP50 . Discproducer . II . PP-50 .